One of the toughest things to address in this job is how much will it cost for a website. This is tough because every website is different (as it should be ). There are many factors to consider in quoting a website. 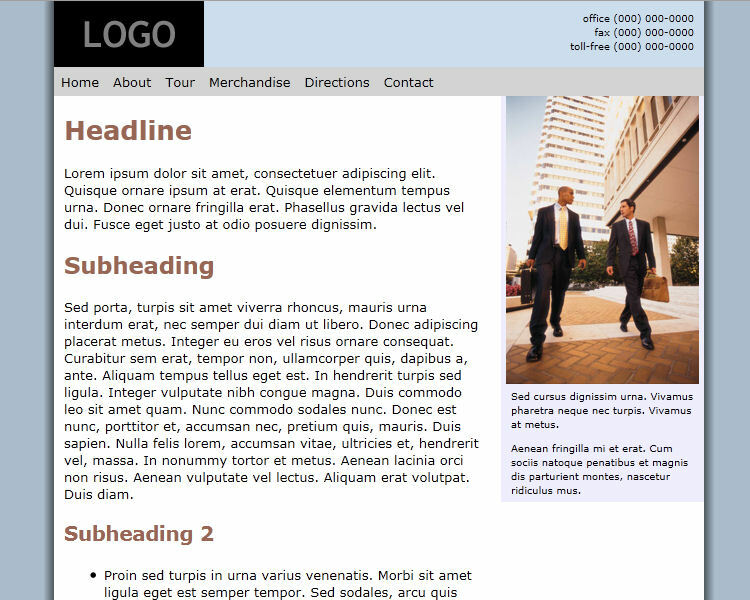 The following are some of the things I consider when coming up with a quote for a website. How many pages are needed to display the information you want. The pages themselves and the links necessary to get to them efficiently take time to set up. One thing to avoid is making pages too long. The temptation for some is to list all their merchandise on one vvvveeerrrryyy long page and let your customers spend their lives scrolling up and down to find what they want. This reduces your page count but increases your customers frustration. Pages should be limited to what fits on at most two pages of 8 1/2 by 11 paper. Taking, editing and placing pictures in a page takes time. 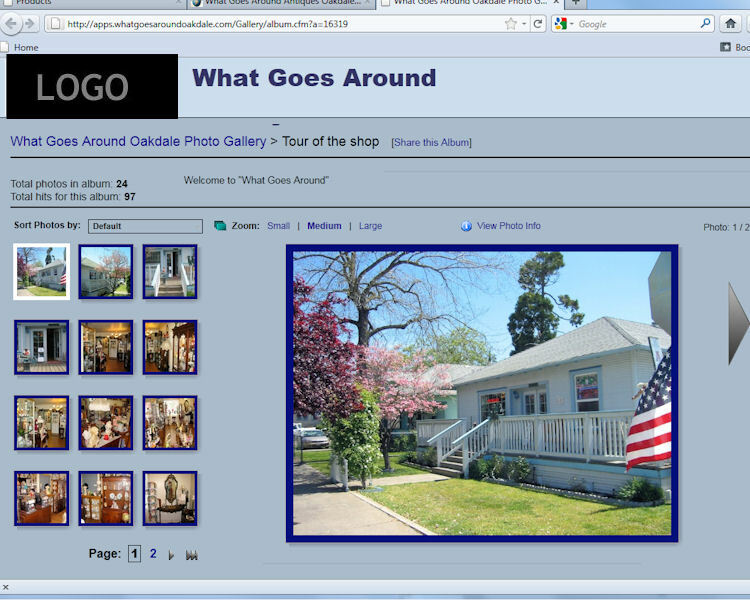 Some websites need a lot of pictures to convey details of the business and others can get by with just a few. 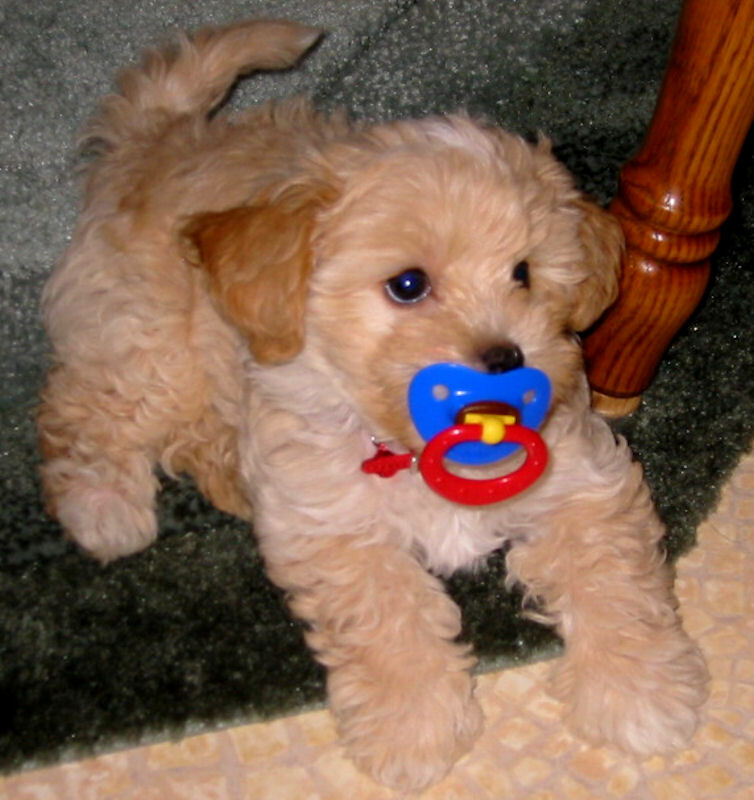 Depending on the picture you may need to show a small thumbnail on the page and allow the user to click to see the enlargement (see puppy to the right). This adds to the time needed to add the picture to the website. The pictures may be best presented in a slide show (like you see on the top of some of my pages). Others are best in a photo album where you can click a thumbnail to see an enlargement. If you can take the pictures and send them to me this will save some expense. Even these will take some effort to crop and resize for the web page and they still need to be added and linked to the page. Pictures are a great way to quickly present information about your business but just about every page on your site needs some text content. Again the nature of your business will dictate how much is needed. I typically meet with you to understand your business and get any content you already have from brochures or news letters. From this I will generate a proposed text content for each page. This will be reviewed with you before the site goes live on the internet. If you are willing to generate the text for each page in some useable format (Word document or text file) it will save you some on the cost of the website. For each customer I prefer to work with you to understand you business and define to you what the website can do for you. There can be many variables to consider. If you need to attract new customers the focus needs to be on web presence and making sure people using the web find the website and thus your business. In this case the focus is more on web presence and less on a large expansive site. If the need is to help existing customers understand your business and products (and thus spend more) the focus needs to be on a more expansive site that lets your customers understand in more detail what you can do for them. You may need to develop custom logos, wall paper, or backgrounds to help your site stand out from the competition. Having talked about all that goes into quoting a website here is an example of a simple website for a business(See layout below). 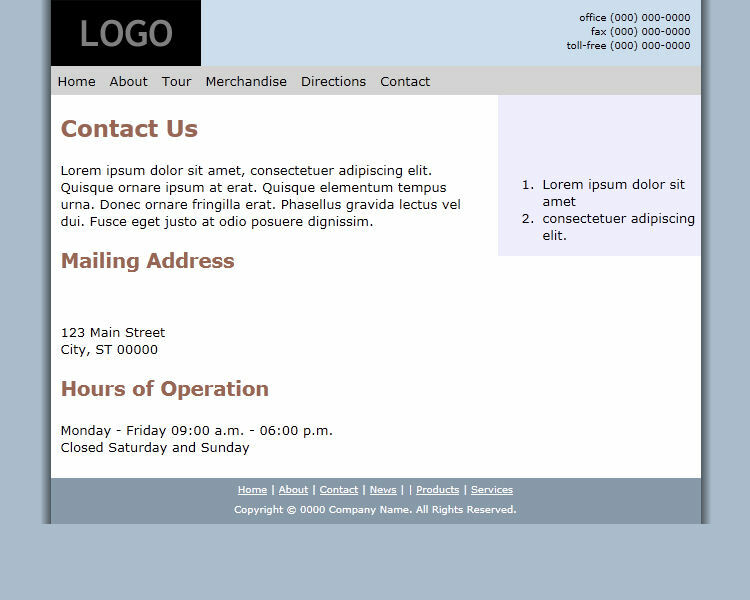 For a site like this with the conditions I document below the typical charge for implementing the site is $900.00. Payments are typically $300 when we agree to develop the site $400 (plus hosting fees) when the site goes live on the internet and $100 per month for the next 2 months as we evaluate and tune the site. In addition you will need to pay for a domain name and hosting plan for the site. This can run as little as $25.00 per year but will vary based on the demands of your site. The prices can vary depending on the amount of graphics needed or the number and complexity of forms needed on the site. The content of the simple site is as follows. You can click on any of the pages to the right to enlarge them. 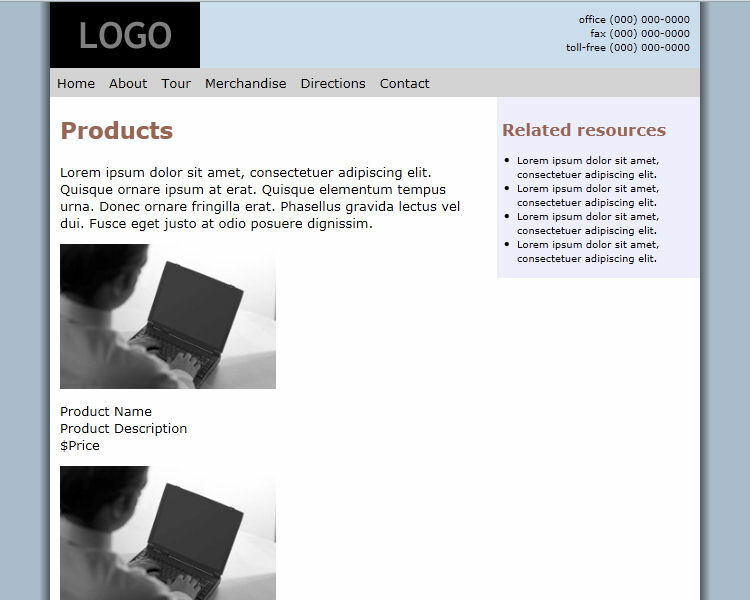 The site will have up to 8 fixed width pages. 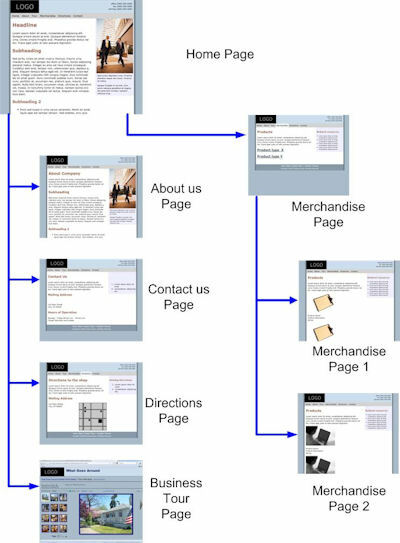 See example of possible pages to the right. Text content on each page is limited to 2 paragraphs. I will generate the text based on input and discussions from you. Each topic page has 1-3 pictures. These pictures can be linked to enlargements is needed. Each extended merchandise page will have up to 20 pictures. I will take the pictures and edit them as needed for the website. 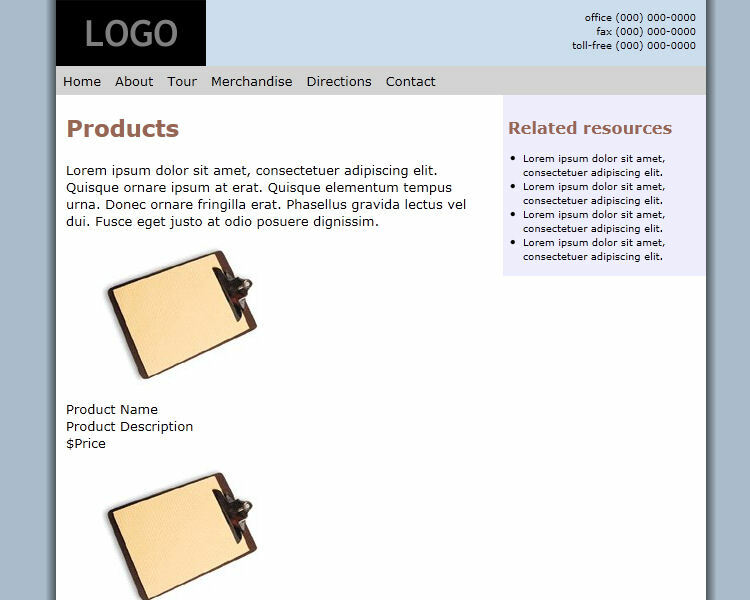 The main merchandise page will talk in more details of the types of products your business has. 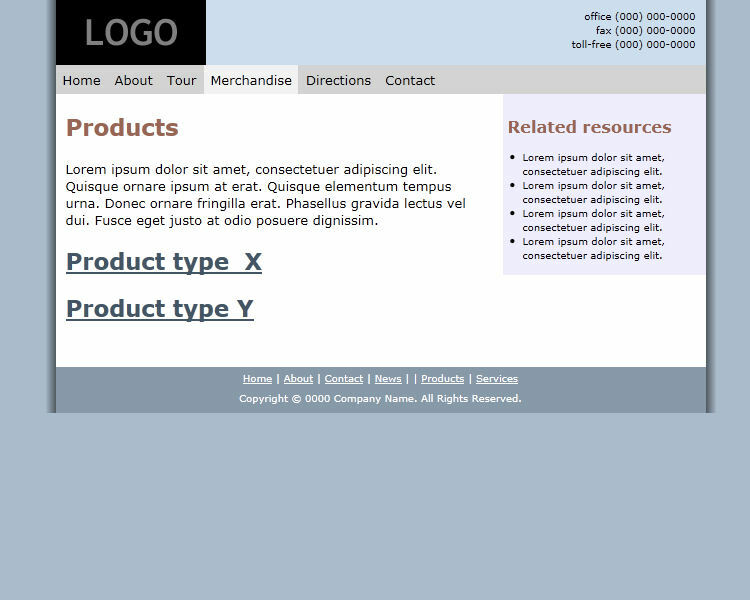 It will discuss any unique characteristics of your products and will provide navigation to the more detailed merchandise pages below it. There will be one slide show on the website. It is typically on the home page but it can be on other pages. It will have up to 10 pictures. I will take the pictures and edit them as needed. The logo for the site can be easily generated from graphics you already have. This might be an image from your business card or a sign already on your building. I will use this as input and do the photo processing to turn it into a logo. The directions will include an embedded reference to Google maps. The business tour page provides a walking tour through the business to give customers an idea of what they will see when they come to the business. It will contain up to 24 pictures in the format shown. I will take the pictures and edit them as needed. 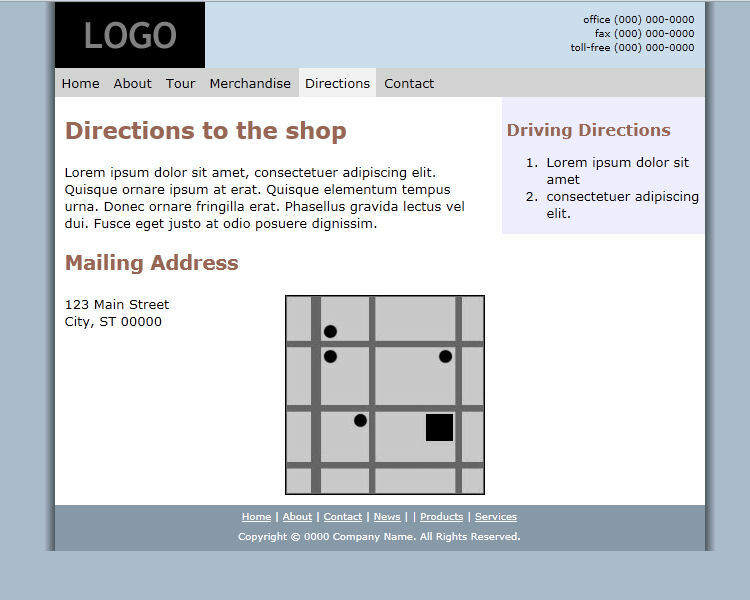 The page header and footer will be simple color or texture blocks with text. The page body will be simple color or texture blocks.